Author's note: I was hoping to steer this blog away from letters of complaint for a while. I can actually be quite understanding! If I go around to a friend's place for a dinner of slow-cooked beef stew, but arrive to find out that the beef has only been stewing for about ten minutes, I say to my friend who is unable to differentiate between a microwave and a slow cooker: "don't stress about it, let's just get take-away". But companies are another matter. Following Woolworths' excellent customer service response to the "Chickengate" saga, I thought the below complaint would be met with a grovelling apology that would provide me with some much-needed winter cheer. Instead, I was met with the oldest trick in the book—total silence. My (unanswered) correspondence is reproduced below. 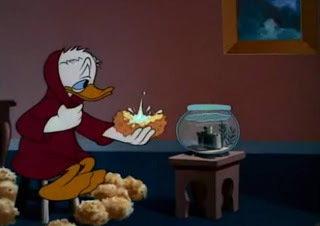 When I was growing up, my Mum bought me a VHS tape of old Donald Duck cartoons. 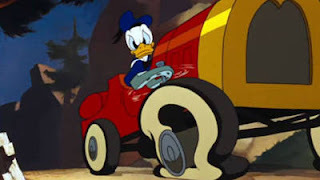 In vintage Disney style, these cartoons featured Donald getting into all sorts of amusing predicaments—for example, "Donald's Tire Trouble" depicted D. Duck's futile attempt to change multiple flat tyres after driving down an unsealed road. Sadly, many of the finer points of pneumatic tyre comedy were lost on my eight-year-old self, having only driven dodgem cars at that stage in life. 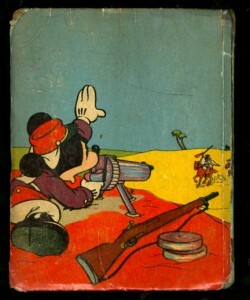 Instead, my favourite Donald Duck cartoon on the VHS tape was "Drip Dippy Donald" (please watch this short excerpt before continuing)—a true classic, equally enjoyable by eight- and eighty-year olds. This brilliant cartoon generates laughs for all ages from a simple premise: a dripping tap makes it impossible for Donald to get to sleep. I would always laugh, perhaps cruelly, at Donald's drip-fuelled misery, being lucky enough to grow up in a house with sound plumbing and attentive parents. And even after I had grown up and moved out of the family home, I would still chuckle at memories of that old cartoon, having never been afflicted by drips in the night (at least as far as faucets were concerned). I had no sympathy. I didn't understand. Or, more specifically, until Tuesday 25 June, when I went to AAMI Park to watch the Melbourne Rebels take on the British Lions. As I made my way to Seat 258, Row F, Aisle 36, Level 1, I noticed the floor beneath the seat was quite damp. "Odd", I thought, "it hasn't rained recently". Never mind though—no sooner than I had sat down, the rugby began! Because of the excitement around the stadium, I barely noticed what I thought was my neighbour spilling a few drops of his drink on my right leg. About a minute later—plop!—it happened again. "Not to worry", I thought, "accidents happen". But, less than 30 seconds later—plop!—I felt a cold splash once again. My patience had run dry. Turning toward my neighbour and commencing to politely inform him that it might be best for him to store his beverage at ground level, I only got as far as "if you don't mind, old sport..." before I realised—he did not have a drink at all. What he did have, however, was a very damp left leg. In an effort to distract myself from the increasing awkwardness setting in between us, I drew my delicious mid-strength beer toward my mouth. If I could not have answers, I could at least have froth. But barely had my lower jaw begun to unhinge itself when a cold, silver dart dropped down from the sky and—plop!—landed directly in my drink. My gaze shot up into the cold winter air. It was a cloudless night. Glimmering amongst the black sky, another silver dart was falling, radiant in the glow of the stadium's light towers. Plop! This one just missed my leg, and instead struck my bag on the floor. I looked up once again to see—plop! (this one hit my neighbour somewhere around the kneecap)—that a steady stream of cold drips were falling somewhere from the underside of the roof. As this roof was very very high, and I was sitting very very much near ground level—plop! (right thigh, mine)—it took a great amount of consistent staring to follow the trail of drips upwards through the air to their source. This took a while, because if I broke my gaze—plop! (top of head, his)—in order to see where the drops landed and defend accordingly, I would lose the trail of drips. Not only did I wish to avoid getting wet—plop! (this was mostly unsuccesful)—but there was also the small matter of a rugby match going on right in front of me that I had paid to watch; by nature I find paid sporting events much more interesting to watch than a slow stream of dripping water, with the possible exception of women's tennis. Eventually I traced the drips to their source—plop-plop! (at times the wind would change and split the drips into two separate warheads, striking both myself and my neighbour with pinpoint Rumsfeld-esque accuracy)—a cylindrical duct attached to the overhanging edge of the stadium roof. It appeared—plop-chuckle-chuckle-chuckle (by now most people in the vicinity were much more entertained by my own version of "Drip Dippy Donald" than the rugby)—that there was a leak in one of the ducts, causing a new drip to appear every ten seconds or so. Fuelled by the particularly peevish kind of frustration that only comes through wearing wet denim, I resolved—plop! (back on the right leg again)—to write to AAMI Park to chronicle my ordeal. 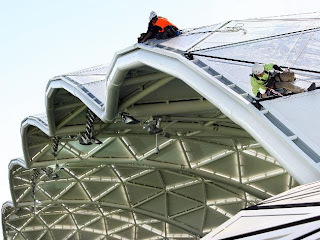 While drafting up this letter, I had a look at the AAMI Park website, which is gushing in its praise of the stadium's roof. One passage states that the roof "has been skinned in a triangular panelised façade that is made up of a combination of glass, metal and louvers, as well as potential for photovoltaic cells and rainwater collection [that] allows the stadium to 'breathe'." After reading this piffle, I am wondering: did one of your architects take the "breathing" stadium idea a bit too seriously, and decide to accurately depict the spit and sputum discharged from a breathing individual's mouth and/or nose during wintertime? Does AAMI Park have the sniffles? I would have written to you sooner, but—plop! (I realise that this "plop" is out of place seeing as I am no longer recounting the events of the night when your stadium's nose dripped on me all night, regardless, I have decided to leave the "plop" in as an artistic touch, in order to remind you that your stadium still leaks despite significant negative media coverage about the stadium's ill-constructed roof on its opening night over three years ago)—ahem, I would have written to you sooner but since being constantly dripped upon a fortnight ago, I have been beset by a strange desire to commit unscrupulous acts, change my name, flee to France and enlist in the Foreign Legion. My doctor thinks it's Legionnaires' Disease. NB: Given that I am impartial to rugby on the best of days (which this was not), the only real positive to come out of this experience was the admirable job my complimentary Herald Sun did of shielding my leg and bag from further innundation. Bravo, Herald Sun, for actually preventing the spread of sloppy filth for the first time in your history. Are you literally fed up of the dripping taps and leaky faucets? Well, we help carrying out all such plumbing repairs in the wide spread areas of Johannesburg. You can contact us online if you want to get in touch with us at anytime. Speaking about the slopes, there are requirements that must be considered include the roofer. Is it justified, despite all the trouble to lose appendage or life just to spare a little measure of cash?